“Latin numerals” redirects here. For counting in Latin, see Latin#Numbers. 1990 as MCMXC, used as the title of musical project Enigma's debut album MCMXC a.D., named after the year of its release. Such variation and inconsistency continued through the medieval period and into modern times, even becoming conventional. Clock faces that use Roman numerals normally show IIII for four o’clock but IX for nine o’clock, a practice that goes back to very early clocks such as the Wells Cathedral clock. However this is far from universal: for example, the clock on the Palace of Westminster in London (aka "Big Ben") uses IV. At the beginning of the 20th century, confusion over the correct representation of 900 (conventionally CM) was reflected in several inscribed dates. For instance, 1910 is shown on Admiralty Arch, London, as MDCCCCX rather than MCMX; on the north entrance to the Saint Louis Art Museum, 1903 is inscribed as MDCDIII rather than MCMIII. Although Roman numerals came to be written with letters of the Roman alphabet, they were originally independent symbols. The Etruscans, for example, used 𐌠, 𐌡, 𐌢, ⋔, 𐌚, and ⊕ for I, V, X, L, C, and M, of which only I and X happened to be letters in their alphabet. Thus, Template:Angbr descends not from the letter Template:Angbr but from a notch scored across the stick. Every fifth notch was double cut i.e. ⋀, ⋁, ⋋, ⋌, etc. ), and every tenth was cross cut (X), IIIIΛIIIIXIIIIΛIIIIXII...), much like European tally marks today. This produced a positional system: Eight on a counting stick was eight tallies, IIIIΛIII, or the eighth of a longer series of tallies; either way, it could be abbreviated ΛIII (or VIII), as the existence of a Λ implies four prior notches. By extension, eighteen was the eighth tally after the first ten, which could be abbreviated X, and so was XΛIII. Likewise, number four on the stick was the I-notch that could be felt just before the cut of the Λ (V), so it could be written as either IIII or IΛ (IV). Thus the system was neither additive nor subtractive in its conception, but ordinal. When the tallies were transferred to writing, the marks were easily identified with the existing Roman letters I, V and X. The tenth V or X along the stick received an extra stroke. Thus 50 was written variously as N, И, K, Ψ, ⋔, etc., but perhaps most often as a chicken-track shape like a superimposed V and I: ᗐ. This had flattened to ⊥ (an inverted T) by the time of Augustus, and soon thereafter became identified with the graphically similar letter L. Likewise, 100 was variously Ж, ⋉, ⋈, H, or as any of the symbols for 50 above plus an extra stroke. The form Ж (that is, a superimposed X and I like: 𐊌) came to predominate. It was written variously as >I< or ƆIC, was then abbreviated to Ɔ or C, with C variant finally winning out because, as a letter, it stood for centum, Latin for "hundred". The hundredth V or X was marked with a box or circle. Thus 500 was like a Ɔ superimposed on a ⋌ or ⊢, becoming D or Ð by the time of Augustus, under the graphic influence of the letter Template:Angbr. It was later identified as the letter D; an alternative symbol for "thousand" was (I) (or CIƆ or CꟾƆ), and half of a thousand or "five hundred" is the right half of the symbol, I) (or IƆ or ꟾƆ), and this may have been converted into Template:Angbr. This at least was the etymology given to it later on. A third hypothesis about the origins states that the basic ciphers were I, X, C and Φ (or ⊕) and that the intermediary ones were derived from taking half of those (half a X is V, half a C is L and half a Φ/⊕ is D). Minuscule (lower-case) letters were developed in the Middle Ages, well after the demise of the Western Roman Empire, and since that time lower-case versions of Roman numbers have also been commonly used: i, ii, iii, iv, and so on. Since the Middle Ages, a "j" has sometimes been substituted for the final "i" of a "lower-case" Roman numeral, such as "iij" for 3 or "vij" for 7. This "j" can be considered a swash variant of "i" (see example ). The use of a final "j" is still used in medical prescriptions to prevent tampering with or misinterpretation of a number after it is written. 6 Ϛ Either from a ligature of VI, or the Greek numeral 6: stigma (Ϛ). 500 Q Redundant with D, abbreviates quingenti, Latin for 500. Chronograms, messages with numbers encoded into them, were popular during the Renaissance era. The chronogram would be a phrase containing the letters I, V, X, L, C, D, and M. By putting these letters together, the reader would obtain a number, usually indicating a particular year. Names of monarchs and popes, e.g. Elizabeth II of the United Kingdom, Pope Benedict XVI. These are referred to as regnal numbers; e.g. II is pronounced "the second". This tradition began in Europe sporadically in the Middle Ages, gaining widespread use in England only during the reign of Henry VIII. Previously, the monarch was not known by numeral but by an epithet such as Edward the Confessor. Some monarchs (e.g. Charles IV of Spain and Louis XIV of France) seem to have preferred the use of IIII instead of IV on their coinage (see illustration). The year of production of films, television shows and other works of art within the work itself. It has been suggested – by BBC News, perhaps facetiously – that this was originally done "in an attempt to disguise the age of films or television programmes." Outside reference to the work will use regular Hindu–Arabic numerals. Roman numbers on stern of Cutty Sark, Greenwich, showing draft in feet. Page numbering of prefaces and introductions of books, and sometimes of annexes, too. Sequels of movies, video games, and other works (as in Jaws IV). In astronomy, the natural satellites or "moons" of the planets are traditionally designated by capital Roman numerals appended to the planet’s name. For example, Titan's designation is Saturn VI. In computing, Roman numerals may be used in identifiers which are limited to alphabetic characters by syntactic constraints of the programming language. In LaTeX, for instance, \labelitemiii refers to the label of an item in the third level iii of a nested list environment. In military unit designation, Roman numerals are often used to distinguish between units at different levels. This reduces possible confusion, especially when viewing operational or strategic level maps. In particular, army corps are often numbered using Roman numerals (for example the American XVIII Airborne Corps or the WW2-era German III Panzerkorps) with Hindu-Arabic numerals being used for divisions and armies. In tarot card game, Roman numerals (with zero) are used to denote the trump cards. Capital or small capital Roman numerals are widely used in Romance languages to denote Template:Strong, e.g. the French xviiie siècle and the Spanish siglo XVIII mean "18th century". Slavic languages in and adjacent to Russia similarly favour Roman numerals (XVIII век). On the other hand, in Slavic languages in Central Europe, like most Germanic languages, one writes "18." (with a period) before the local word for "century". In many European countries, mixed Roman and Hindu-Arabic numerals are used to record dates (especially in formal letters and official documents, but also on tombstones). The Template:Strong is written in Roman numerals, while the day is in Hindu-Arabic numerals: 14.VI.1789 is 14 June 1789. In parts of Europe it is conventional to employ Roman numerals to represent the Template:Strong in hours-of-operation signs displayed in windows or on doors of businesses, and also sometimes in railway and bus timetables. Monday, taken as the first day of the week, is represented by I. Sunday is represented by VII. The hours of operation signs are tables composed of two columns where the left column is the day of the week in Roman numerals and the right column is a range of hours of operation from starting time to closing time. In the sample chart (left), the business opens from 9 AM to 5 PM on Mondays, Wednesdays, and Thursdays; 10 AM to 7 PM on Tuesdays and Fridays; and to 1 PM on Saturdays; and is closed on Sundays. In several European countries Roman numerals are used for floor numbering. For instance, apartments in central Amsterdam are indicated as 138-III, with both a Hindu-Arabic numeral (number of the block or house) and a Roman numeral (floor number). The apartment on the ground floor is indicated as '138-huis'. The number zero does not have its own Roman numeral, but the word nulla (the Latin word meaning "none") was used by medieval computists in lieu of 0. Dionysius Exiguus was known to use nulla alongside Roman numerals in 525. About 725, Bede or one of his colleagues used the letter N, the initial of nulla, in a table of epacts, all written in Roman numerals. 1/12 • uncia, unciae "ounce"
2/12 = 1/6 •• or : sextans, sextantis "sixth"
3/12 = 1/4 ••• or ∴ quadrans, quadrantis "quarter"
4/12 = 1/3 •••• or :: triens, trientis "third"
1/24 semuncia, semunciae (from semi- + uncia, i.e. ½ uncia), represented by several variant glyphs deriving from the shape of the Greek letter Sigma (Σ), one variant resembling the pound sign (£) without the horizontal line(s) (𐆒) and another resembling the Cyrillic letter Є. 1/36 binae sextulae, binarum sextularum ("two sextulas") or duella, duellae, represented by a sequence of two reversed Ss (ƧƧ). One of these was the apostrophus, in which 500 (usually written as "D") was written as |Ɔ, while 1,000 was written as C|Ɔ instead of "M". This is a system of encasing numbers to denote thousands (the Cs and Ɔs functioned in this case as the Roman equivalent of parentheses), and has its origins in Etruscan numeral usage. The D and M used to represent 500 and 1,000 in conventional Roman numerals were probably derived from |Ɔ and C|Ɔ, respectively. This needs to be distinguished from the custom of adding both underline and overline to a Roman numeral, simply to make it clear that it IS a number, e.g. MCMLXVII . Certain (serif) typefaces, for example Times New Roman, are designed with serifs that simulate the appearance of the under/over bar, e.g. MCMLXVII. ^ Alphabetic symbols for larger numbers, such as Q for 500,000, have also been used to various degrees of standardization.Gordon, Arthur E. (1982). Illustrated Introduction to Latin Epigraphy. Berkeley: University of California Press. ISBN 0520050797. ^ Reddy, Indra K.; Khan, Mansoor A. (2003). Essential Math and Calculations for Pharmacy Technicians. CRC Press. https://books.google.com/books?id=U3QY7gz0C2cC. ^ Dela Cruz, M. L. P.; Torres, H. D. (2009). Number Smart Quest for Mastery: Teacher's Edition. Rex Bookstore, Inc.. https://books.google.com/books?id=PVK6lt2xXz4C. ^ Martelli, Alex; Ascher, David (2002). Python Cookbook. O'Reilly Media Inc.. https://books.google.com/books?id=yhfdQgq8JF4C. ^ Stroh, Michael. Trick question: How to spell 1999? Numerals: Maybe the Roman Empire fell because their computers couldn't handle calculations in Latin. The Baltimore Sun, December 27, 1998. ^ Hayes, David P.. "Guide to Roman Numerals". Copyright Registration and Renewal Information Chart and Web Site. http://chart.copyrightdata.com/ch02.html. ^ Adams, Cecil (February 23, 1990). "The Straight Dope". The Straight Dope. 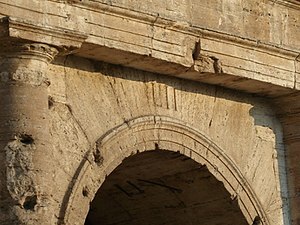 http://www.straightdope.com/columns/read/1371/what-is-the-proper-way-to-style-roman-numerals-for-the-1990s. ^ a b Pickover, Clifford A. (2003), Wonders of Numbers: Adventures in Mathematics, Mind, and Meaning, Oxford University Press, p. 282, ISBN 9780195348002, https://books.google.com/books?id=52N0JJBspM0C&pg=PA282 . ^ Adams, Cecil; Zotti, Ed (1988), More of the straight dope, Ballantine Books, p. 154, ISBN 9780345351456 . ^ "Gallery: Museum's North Entrance (1910)". Saint Louis Art Museum. http://www.slam.org/century_of_free/gallery.php. Retrieved 10 January 2014. "The inscription over the North Entrance to the Museum reads: "Dedicated to Art and Free to All · MDCDIII". These Roman numerals translate to 1903, indicating that the engraving was part of the original building designed for the 1904 World's Fair." ^ a b Asimov, Isaac (1977) . Asimov On Numbers. Pocket Books, a division of Simon & Schuster, Inc. p. 9. ^ Keyser, Paul (1988). "The Origin of the Latin Numerals 1 to 1000". American Journal of Archaeology 92: 529–546. ^ Sturmer, Julius W. Course in Pharmaceutical and Chemical Arithmetic, 3rd ed. (LaFayette, IN: Burt-Terry-Wilson, 1906). p25 Retrieved on 2010-03-15. ^ Bastedo, Walter A. Materia Medica: Pharmacology, Therapeutics and Prescription Writing for Students and Practitioners, 2nd ed. (Philadelphia, PA: W.B. Saunders, 1919) p582 Retrieved on 2010-03-15. ^ Perry, David J. Proposal to Add Additional Ancient Roman Characters to UCS. ^ Owen, Rob (2012-01-13). "TV Q&A: ABC News, 'Storage Wars' and 'The Big Bang Theory'". Pittsburgh Post-Gazette. http://communityvoices.sites.post-gazette.com/index.php/arts-entertainment-living/tuned-in-journal/31514-tv-qaa-abc-news-storage-wars-and-the-big-bang-theory. Retrieved 2012-01-13. ^ Bachenheimer, Bonnie S. (2010). Manual for Pharmacy Technicians. ISBN 158528307X. ^ (in French) Lexique des règles typographiques en usage à l'imprimerie nationale (6th ed.). Paris: Imprimerie nationale. March 2011. pp. 126. ISBN 978-2-7433-0482-9. On composera en chiffres romains petites capitales les nombres concernant : ↲ 1. Les siècles. ^ Maher, David W.; Makowski, John F., "Literary Evidence for Roman Arithmetic with Fractions", Classical Philology 96 (2011): 376–399. ^ "Merriam-Webster Unabridged Dictionary". http://www.merriam-webster.com/dictionary/apostrophus. FAQ: Why do clocks with Roman numerals use "IIII" instead of "IV"? This page uses content from the English language Wikipedia. The original content was at Roman numerals. The list of authors can be seen in the page history. As with this Familypedia wiki, the content of Wikipedia is available under the Creative Commons License.